Sophomore guard Lexus Levy goes up for a basket during a game against Maryland last month. Women’s basketball returns home for the first time in more than two weeks to take on Mercer Friday. The Colonials (2–8) are riding a three-game losing streak heading into the match. The team’s most recent loss against South Florida tied the Colonials’ lowest point total in a game this season with a final score of 63–30. The Bears (6–5) are fresh off a win against Howard, propelled by a double-double from senior forward Amanda Thompson, who ended the night with 21 points and 18 rebounds. The last time the two teams faced off, Mercer outscored GW 22–5 in the first quarter. GW ultimately fell to Mercer last season despite a double-double effort from senior guard Brianna Cummings. The Colonials have had 11 days to recover after having one of their worst offensive performances this season against Southern Florida. If GW wants the win in Friday’s contest, it should take advantage of Mercer’s rocky defense. The Bears have allowed opponents to pick up 63.9 points per game, and beyond the arc, opponents are shooting at a 35.0 percent clip against Mercer. GW’s three-point shooting has been one of the stronger points of the team’s offensive effort this season, and this matchup gives GW an opportunity to do some damage from the perimeter. On paper, the game looks to be a deadlock under the rim with the Colonials averaging 33.4 rebounds per game to Mercer’s 33.9. Thompson’s 8.4 rebounds per game pits her as the leading rebounder for Mercer and GW, but the rest of the Bears’ roster puts up comparable numbers to GW’s under the glass. If the Colonials execute a gang mentality under the rim, they could outrebound Mercer and get extra opportunities to score. Mercer does not suffer from the same offensive struggles that have plagued GW. The Bears score an average of 65.3 points per game, compared to the Colonials’ 49.2 points per game average, and most recently dropped 85 points in their last win. If Mercer brings the same level of offensive production it has had all season, GW will be hard-pressed to compensate. In their most recent match against Howard, the Bears were led by Thompson and senior guard KeKe Calloway. The duo scored a combined 48 points, accounting for more than half of their team’s points overall. While it was a breakout game for Thompson, Calloway has sustained that level of production all season – averaging 20.3 points per game. The duo will be key players for Mercer to continue its offensive push. 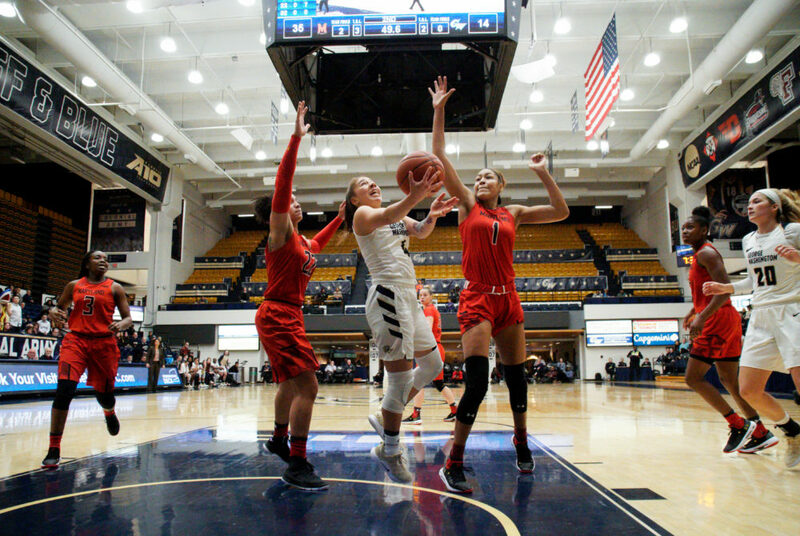 The Colonials have struggled to break through their opponents’ defense and score meaningful points in the paint. Against Villanova, GW only scored four points from the key in the entire game. If the Bears clog the paint and force GW to take shots father away from the rim, they should be able to stymie the Colonials’ scoring. If the Colonials can improve their interior shooting, they could keep up with Mercer in what will likely be a high-scoring match for the Bears. But the Bears’ impressive offense, bolstered by Calloway and Thompson, will be difficult for GW to overcome. Even if GW’s offense steps up, the odds will be in the Bears’ favor against the Colonials.